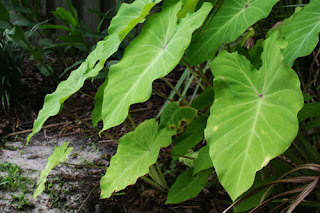 The Rainforest Garden: Great Tropical Tubers to Overwinter! 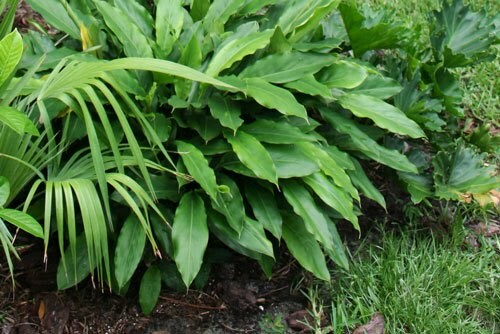 Why waste money on annuals when you can plant bold tropical plants year after year? 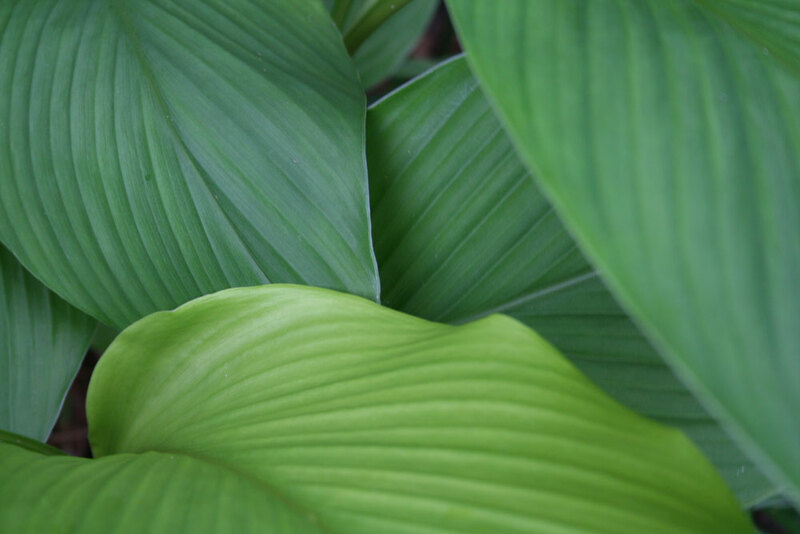 Everyone's familiar with cannas, elephant ears and dahlias, but the same boring varieties have been overused to the point of cliche. Temperate and tropical gardeners alike can try these decidedly more exotic looking tropicals in the garden, knocking the socks off those tired marigolds and coleus. I may be lucky enough to keep most of my tropicals in the ground year round, but you don't need moderate winters to create a lush understory. Here are some great tropicals that would be easy for a beginner to overwinter! Also known as false cardamon, alpinia nutans gets my vote for best ginger for its delicious evergreen leaves smelling of spices, and its dense arching form. There are other alpinia gingers with more interest like the immense shell ginger with its porcelain clusters of flowers, borne on second year growth. 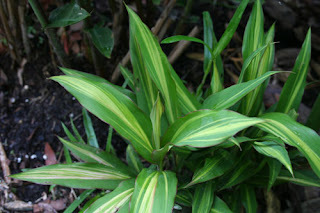 It also comes in a smaller form, variegated with yellow and green which is much more commonly sold. Alpinia formosana "pinstripes" has similar leaves but are variegated with white pinstripes. Since alpinias are evergreen, they are excellent candidates for overwintering in containers provided you mist the foliage to combat spider mites. 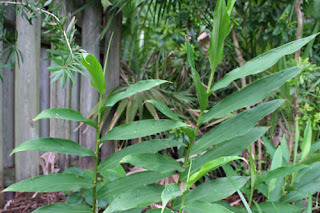 This genus of gingers ranges from the five foot leaves and hidden flowers of (the culinary spice and colorant) Turmeric, to the small leaves and dainty bracts held aloft of the Siam Tulip. All have cone like inflorescences and make excellent cut flowers. These prefer moisture and some shade, but should be okay as long as they're not in full sun and dry soil together. Dig and divide the swollen roots in late fall after the leaves have declined, and store in dry sawdust or milled sphagnum moss. Sandy soil makes an acceptable substitute. These aren't the same boring elephant ears you're used to! The most commonly sold 'elephant ears' are in the colocasia and xanthosoma genus' and lack the glossy succulent leaves of this adaptable group of aroids. 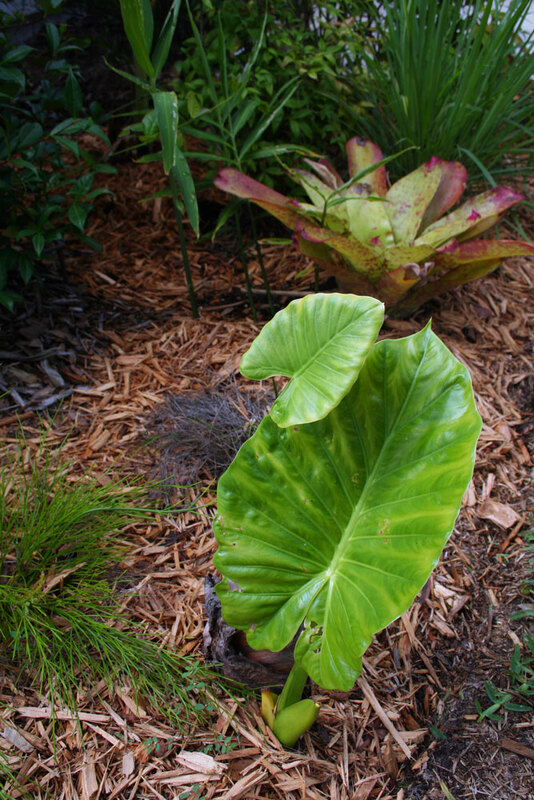 Hardier ones include A. Odora, A Macrorhizza, A Wentii and plenty of cultivars, such as the Alocasia "California" to the left. The clumps won't get this big if you dig them up in winter, but they're prolific enough to give you lots of plants each year. They prefer moist soil, but are very adaptable. Overwinter in a dry medium, or pot them up with considerably less water. There are plenty of unusual variants of the so called "elephant ear", ranging from purple to black and even chartreuse, as seen to the left. One of my favorites is a purple tinged variety with cupped leaves that collect dew and rainwater before they fill up, tipping over, spilling the water and springing back up. I think that these would be great in a Japanese style garden in a vignette with a bamboo "deer scarer" which performs the same act! Be wary of colocasia aquatica, which has taken over drainage ditches, ponds and swamps all over florida with its invasive runners. Store these as you would alocasias, in a dry medium. With gracefully arching leaves and bright red cones erupting from the ground, the "shampoo" substitute within the flower bracts is the icing on the cake! The inflorescence provides a fragrant natural soap that is actually bottled up and sold in Southeast Asia and used as an additive elsewhere. If you'd rather not use it for bathtime, the bright red cones make long lasting cut flowers and look stunning with the leaves of an alocasia! 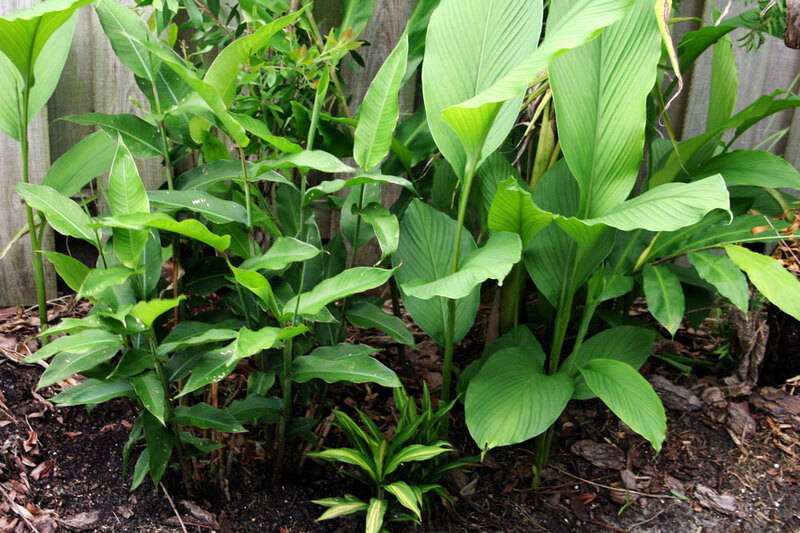 Store these when they go dormant as you would with curcuma, before the first frost. A neat little secret about these Polynesian beauties is that you can cut segments of the cane, pinning them to the soil lengthwise to root them and start new plants! This winter I'm cutting them all to the ground before a freeze does the job for me, and rooting them indoors. You can also bring them indoors and overwinter them in pots if you choose, so either way you can't lose. "Kiwi" is the pictured variety and seems to handle the cold best, but there are "ti"s in every color of the rainbow (almost) to choose from. 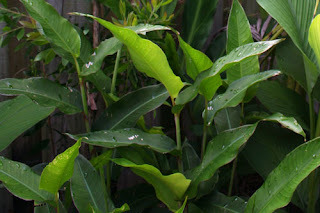 My hedychium coronarium haven't displayed their fragrant white blooms yet, but the alternating leaves still fascinate me, looking for all the world like ladders. This genus prefers moist soil like most of the gingers, but I've sen them adapt to many different sites. However, the most impressive stands I've seen are naturalized ones along streams, growing right into the water! There are lots of other hedychiums to choose fro, and my favorites are the ones with intense flame orange blooms. Store as you would curcuma. Heliconia is one of the most tropical ornamental genus' out there, but are definitely worth a shot for a temperate gardener for their exotic inflorescences and lush foliage. Pick a small variety that stands a chance of flowering in the same year from the roots, and bring it indoors to a sunny spot before it starts to get cold. Though they love water outdoors, its okay to let them dry out a little when kept in the house. They're probably going to look ratty towards spring, so I recommend cutting back the stalks that have flowered and it will still take off in spring. If you live in zone 8b or below, give the hardiest one a shot, heliconia schiedeana. It gets really big, but stands the best chance of overwintering outdoors! Tropical tubers, corms and rhizomes are a great way to extend your planting season through winter, since you can divide and pot up bulbs even if its icy outside. There's something exhilarating about the spicy smell of ginger roots or the earthy scent of liriope when you're dividing their fragrant rhizomes. Be sure to share your spoils with loved ones during the holidays by artfully wrapping your favorite roots in newspaper, twine or raffia, making sure to include fun and detailed instructions to the would be gardener. Imagine your sister's surprise when her ugly bulb erupts into life, like the newly planted alocasia to the right! Make sure you plant you most unusual tubers where visitors can see them, and interplant with finer foliage to make them stand out. Most importantly, have fun and don't get discouraged if you're unlucky at first. If your ginger doesn't overwinter, the worst case scenario is that dies, and even then you had a very exotic annual for one year. You can't lose! Looking good. I do miss seeing these plants planted in people's yard in Florida. About the only thing I miss about Florida. Haha. Great post, RainforestGardener. So much beautiful tropical foliage. You've given me lots of food for thought. I especially like the upright elephant ear...ripply edges and color...and the cinnamon ginger...for the look and the scent. Does the cinnamon ginger freeze back or is it cold hardy? I've got a great place for the upright elephant ear. Thanks! You have a lot of lush tropicals. I love them too and now that they are back in full force I've forgiven them for leaving me this winter. I'm going to have to try moving some of my butterfly gingers to the boggy area. I didn't know they grow right next to streams and even into the water. Thanks for so much good info. Interesting post but still don't think I could overwinter any of those outside. Some of them do well in our greenhouse. I am definitely going to try the species of Heliconia you recommend. Some really great plants. You are in for a special treat when your butterfly ginger flowers. As well as attractive white flowers, the scent is intoxicating. I bought mine by following my nose in a nursery until I found where the beautiful smell came from. You'll love it. Ahhhh, the tropical beauty of gingers! Love that family of plants. If only they were evergreen, they would be quite perfect, I think. This will be the first year that they'll be big enough to flower, though I've enjoyed the smells from nurseries from time to time. 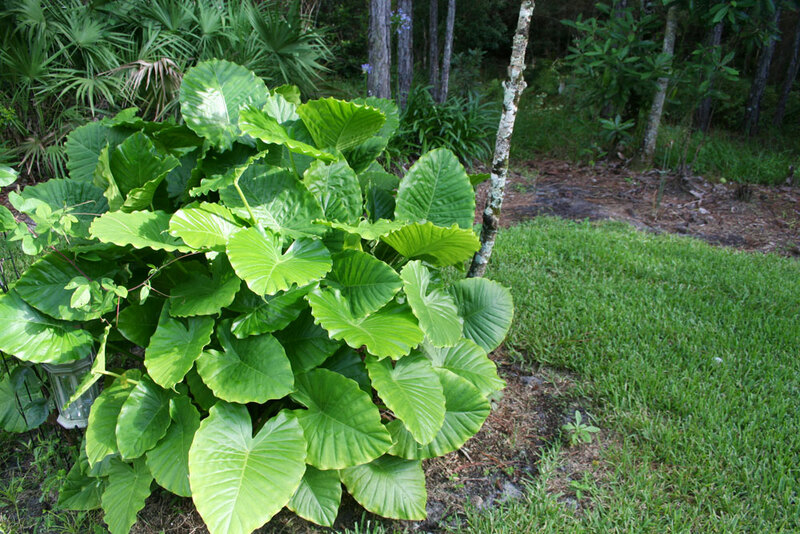 Try the cinnamon ginger if you want evergreen, since it retained one third of its green leaves with no protection. Also, alpinia zerumbet is good if its in a protected spot. Love the suggestions. Where do you find the cinnamon ginger? I got it at a local nursery called gecko gardens in Jacksonville... this ginger's worth finding! Its doubled its size since last year. You should see how full it is now! 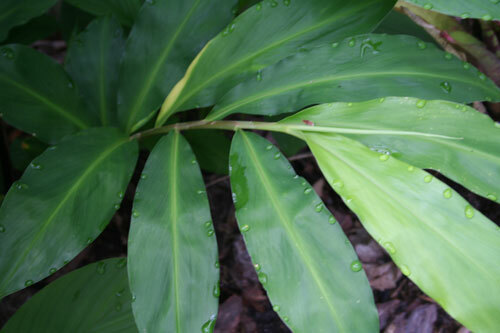 Its all the way up to my chest, gets covered in dew into the afternoon, and is still my favorite plant in the garden. I'm sure it will do great there! Plants that size MIGHT die down at first during a freeze, but they'll recover quickly if they do. Thanks for stopping by, and enjoy the plants!